Mike Crockett, Stacie Kageyama, Delfina Homen, Carrie Lewis, Jane Osborn, & Logan Sander -- This research was conducted as a group project for Botany 465 Lichenology at Oregon State University during spring term, 2003. Historically, a large portion of the world's medicine has been derived from plants and fungi. Salicylic acid is the active ingredient in aspirin and this acid is found in the genus Salix. Important antibiotics such as penicillin are of course derived from fungi. Lichens are another type of organism that may hold the potential for medical exploration. In the past, Native Americans used lichens for ancient medicine and ceremonial practices. For example, both the Nitinaht and Makah of the Pacific Northwest used Usnea longissima as a dermatological aid for dressing wounds. The Cheyenne, Oweekeeno, and the Yurok Indians used Letharia vulpina to make a yellow dye. By investigating traditional uses of these lichens, modern science is given a foundation for exploration of lichen species and their chemical constituents. Lichens produce protective secondary metabolites that serve to deter herbivory and colonization by pathogens. Usnic acid, stictic acid, and vulpinic acid are a few of the 700 plus secondary compounds that are produced by lichens. Researchers found that pure extracts of usnic acid, evernic acid, and vulpinic acid inhibited the growth of gram positive bacteria Staphylococcus aureus, Bacillus subtilis, and Bacillus megaterium, but the acids had no affect on the gram negative bacteria Escherichia coli or Pseudomonas aeruginosa. Interest in the antibiotic potential of lichen compounds was extremely high during the post-World War II era through the end of the 1950's. A secondary compound that generated a high amount of interest and considerable research was usnic acid. In fact, sixty-four papers are known to have been published on usnic acid between 1950-1959. In the 1970's, usnic acid was reported to have potential as an anti tumor drug. Once again there is an interest in the potential uses of antibiotics derived from lichens as lichens may be a valuable source of antibiotics for the pharmaceutical industry in the future. The goal of our study was to determine the potential antibiotic properties of four lichen species from the Pacific Northwest: Hypogymnia apinnata, Letharia columbiana, Lobaria pulmonaria, and Usnea filipendula, and to detect what secondary compounds may be present in the four lichen species by using Thin Layer Chromatography. Along with determining what secondary compounds are present in the four lichen species, a tincture of Usnea barbata purchased at a health food store was also analyzed for compounds present. Lichen species. The lichen species chosen for the study H. apinnata, L. columbiana, L. pulmonaria, and U. filipendula were chosen due to the production of unique secondary compounds produced by each lichen. Material of fresh H. apinnata, L. columbiana, L. pulmonaria, and U. filipendula were collected from the sites listed in table 1. These particular species were also chosen because they were likely to have fewer secondary compounds than other species of the same genera. Lichens were identified using, Macrolichens of the Pacific Northwest by McCune and Geiser (1997). Voucher specimens have been deposited in the Oregon State University Herbarium. Bacteria species. Four bacteria species were used for this research, two gram positive bacteria, Micrococcus luteus and Staphylococcus aureus and two gram negative bacteria, Salmonella gallinarum and Serratia marcescens, sources for these bacteria are listed in table1. Table 1. Lichens and bacteria used in the study. Extraction of lichen compounds. For the extraction of lichen compounds, lichen material was air-dried and ground with a mortar and pestle. One gram of ground lichen material was soaked in 50 ml of acetone and sealed in test tubes overnight. Identification of lichen compounds. 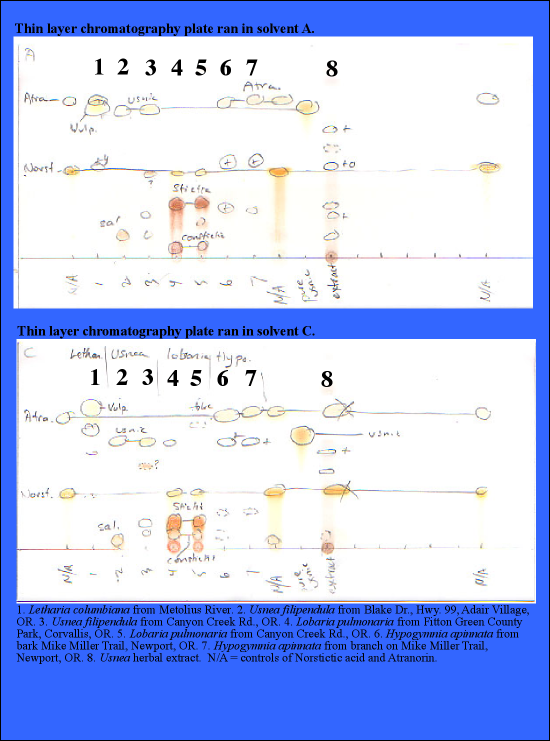 Thin Layer Chromatography was used to determine what compounds were present in each of the four lichens following the protocol used by Culberson (1972). Six drops of each lichen extract was placed on, aluminum-backed silica gel thin layer chromatography plates, with glass capillary tubes. Atranorin, norstictic acid, and pure usnic acid were used as controls and the sample of U. barbata extract purchased from the health food store was also used to satisfy our own consumer curiosity. Plates were ran in Culberson's A and C solvent systems and then checked with UV light and scored for the presence of various compounds. Finally the plates were sprayed with a fine mist of 10% sulfuric acid and then baked for 3 minutes at 100 degrees Celsius to develop samples. Investigation of Antibacterial properties. To determine the most optimal concentration of lichen extract concentration to be used in this study, sterile 7.5 mm filter paper disks were treated with 40 microliters of acetone only (used as a control), and 40, 60 and 80 microliters of each lichen extract. Three treatments were used: no bacteria (used as a control), gram positive S. aureus, and gram negative S. gallinarum. The bacteria were inoculated on full-strength Nutrient Agar (Difco Laboratories cat. 0069) by suspending loops of bacteria in sterile de-ionized water. The bacterial suspension was then smeared on agar plates with a sterile glass-rod to ensure the entire surface of the agar had an even coating of the bacterial suspension. Plates were divided into 4 quadrants and one filter paper disk was placed in each quadrant so that each plate had one disk of each treatment (control, 40, 60 and 80 microliters of lichen extract). Inoculated plates were then incubated at 37 degrees Celsius for 48 hours. The resulting zones of inhibition were quantified by measuring the diameter of the zone at the widest point and then 7.5 mm (the width of the filter paper disk) was subtracted. Based on these results from this portion of the research, we decided to use the intermediate amount, 60 microliters, of extract for the remainder of our research because we observed that 80 microliters had no significant effect greater then 60 microliters. After determining the optimal concentration of lichen extract to use, the lichen samples were tested again, along with four bacteria species, M. luteus, S. aureus, S. gallinarum, and S. marcescens. New plates were inoculated using the protocol described above and the plates were again divided into 4 quadrants. One filter paper disk treated with 60 microliters of each lichen extract and the control were placed in each quadrant of the inoculated plates. 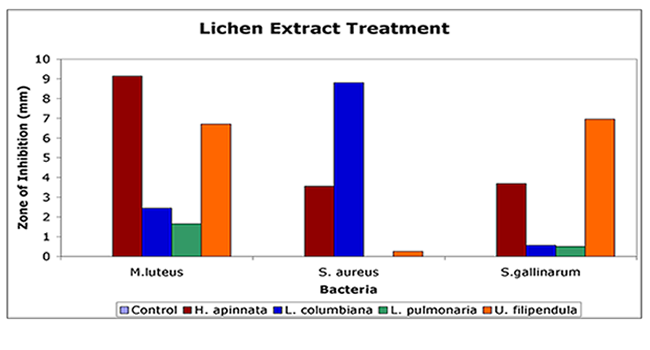 Five plates per lichen extract-bacterium treatment were used for the study. Inoculated plates were incubated in the dark at 37 degrees Celsius for 24 hours. Effects of the lichen compounds on bacterial growth were quantified by measuring the diameter of the zones of inhibition less the size of the treated filter paper disks. Statistical analysis. Data was analyzed with an Analysis of Variance (ANOVA) using S-Plus 6.1 and results are listed in the next section under lichen antibacterial properties. Thin Layer Chromatography. The results from the TLC, indicated that the sample of H. apinnata contained atranorin and a weak UV+ unknown with Rf class = 5 in solvent A and Rf class = 6 in solvent C. The sample of L. columbiana contained vulpinic acid and an unknown substance with a slightly higher Rf class than vulpinic acid in solvent A and a slightly lower Rf class in solvent C. Samples of L. pulmonaria contained stictic (major), norstictic (minor), and constictic (minor) acids. The samples collected of U. filipendula contained both usnic acid and salazinic acid (Table 2 and Figure 1.). And the sample of U. barbata tincture, to our surprise contained no usnic acid. Figure 1. Lichen extracts ran in standard solvents on silica-gel-coated TLC plates. Table2. Compounds determined to be present in the lichen extracts from the TLC results. Lichen antibacterial properties: After the treatment had been applied and the inoculated plates were allowed to grow for 24 hours, we were able to see that the H. apinnata treatment had the greatest effect on plates inoculated with M. luteus, a mean zone of inhibition of 9.15mm was observed. The H. apinnata treatment also had moderate effects on S. aureus and S. gallinarum . The L. columbiana treatment had the greatest effect on S. aureus with a mean zone of inhibition of 8.80mm. Treatment of L. pulmonaria had a marginal effect on M. luteus and a negligible effect on the other bacteria. The U. filipendula treatment had the greatest effect on S. gallinarum with a mean zone of inhibition of 6.95mm and showed a promising effect on M. luteus ( Figure 2). None of the lichen extracts or the control exhibited inhibition of S. marcescens and therefore S. marcescens was not included in Figure 1. The results of the inoculated treatments were statistically significant with a p -value less than 0.0001 (Table 3). Table 3. Analysis of variance table . Figure 2. Effects of lichen extract treatments on bacteria used in this study, measured by the zone of inhibition. In this research effort, the effect of four lichen extract treatments ( H. apinnata, L. columbania, L. pulmonaria, and U. filipendula ) were tested for their level of antibacterial potential against two gram positive and two gram negative bacteria. To determine the compounds present that may produce an inhibitory effect on either of the two different classes of bacteria, we used Thin Layer Chromatography to assay for the compounds present in each lichen extract used. A variety of compounds were found to be present and specific to each lichen extract. Some of the lichen extracts yielded more then one compound for example, the U. filipendula extract contained both salazinic and usnic acid. We observed inhibition in of both gram positive and gram negative bacteria from the U. filipendula extract. It is possible that the two acids work in concert with one another to inhibit growth of both the gram positive and gram negative bacteria. Further questions about the U. filipendula treatment could be asked such as, do the two acids produce an inhibitory effect on the bacteria alone or must they both be present to inhibit bacterial growth. The H. apinnata extract which contained atranorin and also produced inhibition on both gram positive and gram negative bacteria and overall the H. apinnata extract proved to be the most consistent treatment to inhibit bacteria out of all the lichens we tested and warrants further research. The secondary compound vulpinic acid, found in the L. columbiana extract was the most effective inhibiting growth of S. aureus and may hold potential for treating infections resulting from S. aureus. Treatment of L. pulmonaria, proved to be a very mild antibiotic on both gram positive and gram negative bacteria, although three different acids (stictic, norstictic, and constictic acids) were detected from the TLC. No inhibition was observed on S. marcescens with any of the lichen treatments . All of the plates inoculated with S. marcescens were observed to have an even lawn of bacterial growth over the surface of the agar. Overall, our results indicate that lichen compounds do hold potential as a source of antibiotics. The results also indicate that some gram negative bacteria may be more susceptible to the effects of lichen compounds than previously thought. Furthermore, the antibacterial potential that these lichen extracts have expressed shows reasonable merit for further research to be conducted not only on these lichen species but other lichen species as well. Isolated compounds of these lichen species in addition to combinations of other lichen species should be considered for further research and medical exploration. Along with more comprehensive research to determine the full antibiotic properties of lichen compounds, optimum extraction methods should also be refined. In the case of the U. barbata extract purchased from a health food store a cold-press method was implemented and the extract manufacturer claimed that this method was used for the optimum extraction of usnic acid. It became evident to us after conducting the TLC that there was no usnic acid in the extract and the claims of the manufacturer were false. Although lichen compounds do have antibacterial properties, sound scientific research must be used to determine what compounds are useful and how best to extract them in order to provide some legitimacy to a potential medical goldmine. We would like to thank Dave Myrold, Melodie Putnam, and Bruce McCune for allowing us to use their labs for this study. Bruce McCune also funded this project and was willing to share his considerable wisdom with several novices in the study of lichens as well as provide all photographs used in this site. We would also like to thank Jeremy Rich for cultures and Stephanie Boyle for advice on culturing bacteria. Benson, H. J. 1994. Microbiological Applications, Sixth edition, Wm. C. Brown Publishers: Dubuque, IA, 447 pages. Black, J.G. 1996. Microbiology Principles & Applications, 3rd edition. Prentice-Hall: Upper Saddle River, NJ, 790 pages. Cocchietto, M., N. Skert, and P. L. Nimis. 2002. A review on usnic acid, an interesting natural compound. Naturwissenschaften 89: 137-146. Culberson, C. F. 1972. Improved conditions and new data for the identification of lichen products by a standardized thin-layer chromatography method. 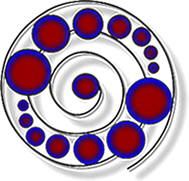 Journal of Chromatography 72: 113-125. Ingólfsdóttir, K. 2002. Molecules of interest: Usnic acid. Phytochemistry 61: 729-736. Lawrey, J. D. 1989. Lichen secondary compounds: Evidence for a correspondence between anti herbivore and anti microbial function. The Bryologist 92: 326-328. Madigan, M.T., J.M. Martinko, and J. Parker. 1997. Brock Biology of Microorganisms, 8th edition. Prentice-Hall: Upper Saddle River, NJ, 986 pages. McCune, B. and L. Geiser. 1997. Macrolichens of the Pacific Northwest. Oregon State University Press: Corvallis, OR, 386 pages. Moerman, D. 1999. Native American Ethnobotany , Timber Press: Portland, OR, 927 pages. Müller, K. 2001. Pharmaceutically relevant metabolites from lichens. Applied Microbiology and Biotechnology 56 : 9-6. Raven, P. H., R. F. Evert, and S. E. Eichhorn. 1992. Biology of plants, Fifth Edition.Worth Publishers: New York, 791 pages. Whiton, J. C. and J. D. Lawrey. 1982. Inhibition of Cladonia cristatella and Sordaria fimicola ascospore germination by lichen acids. The Bryologist 85: 222-226. Whiton, J. C. and J. D. Lawrey. 1984. Inhibition of crustose lichen spore germination by lichen acids. The Bryologist 87: 42-43.